An interesting side story in Chang-su Houchins’s Artifacts of Diplomacy: Smithsonian Collections from Commodore Matthew Perry’s Japan Expedition (1853-1854)1 revolves around a large bronze bell, Gokoku-ji, that was among the items “given” to Commodore Perry during the fourth2 and final exchange of gifts between the U.S. and the Ryukyu Kingdom on 11 July 1854. The only images that I could find of what I assume is the original bell are the low-resolution photos4 below. [Update 11/18/15: See the photo after the next.] The photo after these is of the present-day replica at Annapolis. 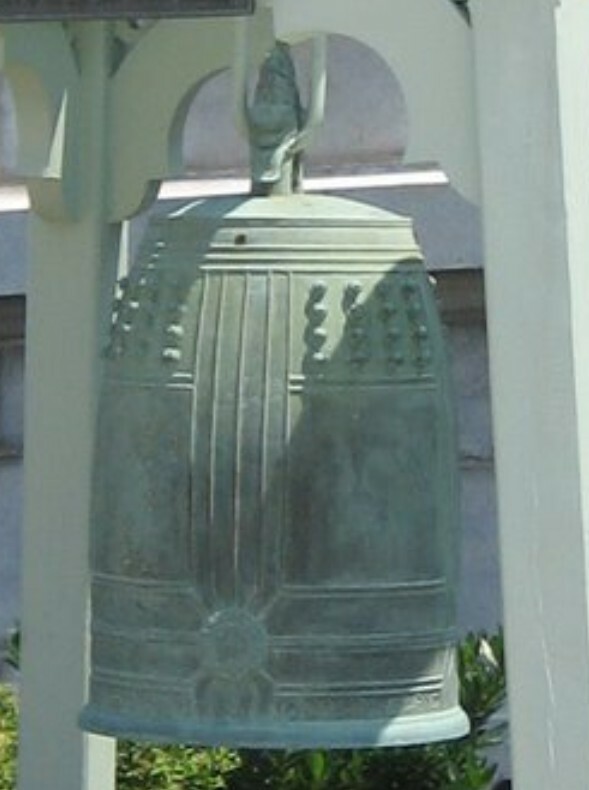 Replica of Gokoku-ji Bell at U.S. Naval Academy. Photo by Brian D. Bell, July 2006. At the time of Commodore Perry’s visits, the bell was kept on the grounds of the Gokoku-ji Buddhist temple in Nami-no-ue, Naha. 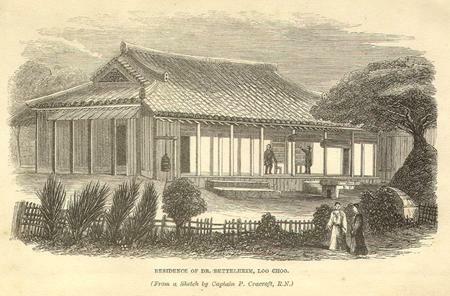 The Bettelheim residence … was on the grounds of the Buddhist temple (Gokoku-ji) in Nami-no-ue, Naha. 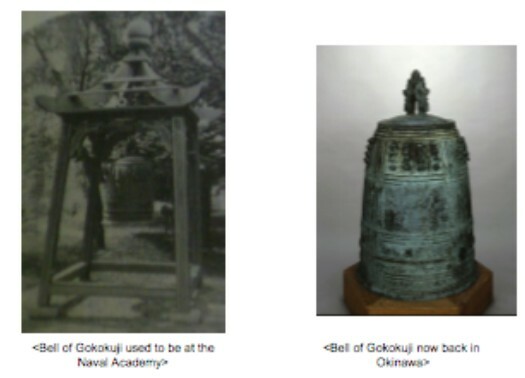 From “Bernard Jean Bettelheim Medical Missionary on Okinawa April 1846 to July 1854.” The bell in the sketch may or may not be the Gokoku-ji. 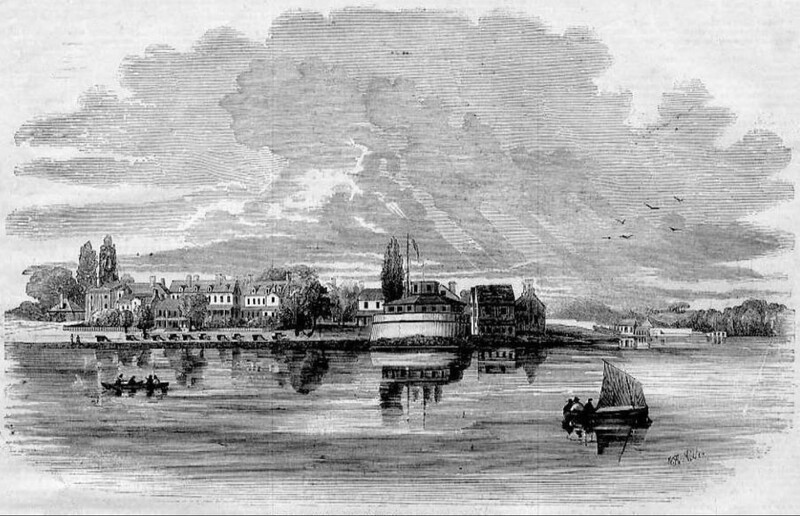 A wood engraving of the Naval Academy, Annapolis, Maryland, based on a sketch by W. R. Miller. Illustrated News, New York, March 1853. 1 Smithsonian Contributions to Anthropology, Number 37, Smithsonian Institution Press: Washington, D.C., 1995. This is a large PDF so it may take a while to load into your reader. See the related post. 2 Commodore Perry made four separate visits to Naha between June May 1853 and July 1854: 12 26 May 1853, 7-8 June 1853, 17 June 1854, and 11 July 1854. In the last, the focus was on negotiations for a treaty between the U.S. and the Ryukyu Kingdom. The kingdom was officially annexed by Japan in 1879. 3 “U.S. Naval Academy Facts, Figures and History,” retrieved 25 June 2013. 4 Yoshikawa Yukie, “Commodore Perry Meets the Ryukyu Kingdom,” Research Web Site, Regional Security Policy Division, Executive Office of the Governor Okinawa Prefecture, n.d. Retrieved 24 June 2013. This entry was posted in History, Images. Bookmark the permalink.